Needs are defined as a form of want where in it is essential for the continued development of a certain person or project. For example, the basic needs of a person are food, water, clothing, and shelter. Although each person has different levels of needs, these are the most common among every individual. Needs are always a deciding factor when it comes to an organization’s profit. This is due to the fact that an organization’s main source of income would be to cater the needs or wants of their targeted customers. When identifying the targeted customer of an organization, organizations typically tend to use several documents to assist them in determining what type of product or service they should focus on selling to their targeted customers or clients. An example of a document being commonly used by organizations as a means of identifying needs is a simple survey questionnaire form where the organization will have some of their employees interview or request certain customers to provide feedback and opinions about the organization. What is an Assessment Form? The term assessment is often viewed as a means of judging or evaluating a certain object or person of interest, this is done so as to ensure that the item being assessed is in good condition and or is capable of performing the expected task being assigned to that item. An assessment is typically done within an assessment form which is made to directly assist the evaluator in conducting the assessment, by simply having the necessary contents and questions written within the sample assessment forms. Assessment forms have several iterations which allow for the use of more specific assessments through the use of specific assessment forms. One example of the many iterations of assessment forms would be a risk assessment form, wherein the purpose of this specific assessment form would be to identify risk or threats and prepare countermeasures or plans to counter act the said risk or threat. Assessment forms typically come in several formats may it be an assessment form in PDF format or an assessment form in DOC or Word format to allow the users of the assessment forms to decide whether to use the PDF format directly or use a Doc format assessment form which would allow for easier editing. What Is a Need Assessment Form? As stated earlier at the start of this article, needs can be defined as a person’s basic requirements for a standard lifestyle and are often the means for organizations of earning a profit by selecting a type of product or service that would cater to the targeted customer or client’s needs. A need assessment is a type of assessment form that would typically assist a person or an organization in determining the value of a certain item which will often be one of the factors involved whenever a person will handle decision making. In terms of business, a needs assessment form can help an organization identify what type of improvements they should make to the organization’s products, employee performance or even means of improving customer satisfaction. What Is an Emergency Needs Assessment Form? The term emergency is often used as a means of describing a certain situation that would typically cause a negative impact on a person or their property. This term is so often used that a list of the different levels of state emergencies is made that would catalog all of what could possibly happen. If you wish to know of the five levels of emergency then continue reading through this article. Now, an emergency needs assessment is a type of assessment form that focuses on the idea of identifying or rather assessing the situation so as to determine the next course of action to take. This type of assessment is often done after the actual emergency and is typically a means of allowing the person to make the best decision wherein a wrong decision would turn the emergency into something more serious. What Are the Five Levels of State Emergency? As stated earlier, there are five levels of emergency and these are used as a means of identifying the seriousness of the situation. The need for this kind of practice is often viewed as a means of efficiently allocating enough resources or manpower to a specific situation to avoid excessive interaction. Level 5, otherwise known as a normal operation level, is often viewed as the normal level of which a state or nation is functioning. In other words, it is the usual day to day happenings. Level 4, otherwise known as elevated operation level wherein this level of state emergency is often associated with the potential of an emergency occurring be it a potential bomb threat, or similar forms of potential emergencies. This level of emergency is often followed with the conducting of a control risk assessment to identify the validity of the threat. Level 3, otherwise known as the declaration of state emergency is the level that indicates that an actual emergency is occurring or is currently happening. This is typically the time where an emergency risk assessment will be conducted to identify the best course of action to prevent mass panic. Level 2, also known as a major disaster state emergency is a level where a disaster has occurred and continues to progress such as a pandemic or an escalation of further disasters. This is the level of emergency when martial law will typically begin to contain the disaster. During this level, a mandatory curfew will be put in place which will often conflict with the time schedules of most employment terms and conditions as stated in an employee’s employment contract. Level 1, which is known as the catastrophic level is considered to be the highest and most dangerous level of the state emergency. This indicates that the disaster that caused the emergency reaches a point wherein containment or prevention is no longer a viable option, and the government of the nation will be required to take a more direct approach in dealing with the disaster. What Are the Basic Needs of a Person? By the name itself, we can determine this as a basic need due to the fact that each person will require a place to stay and rest when there is no need to work. This is often acquired through the usage of property agreement forms so as to guarantee that there is proof for the transaction which has taken place. The need for shelter is a rather pre-historic need in the sense that early humans were always concerned about finding shelter for the same purpose all of us do: protection and security. Clothing is another basic need of a person that is often associated with the idea of standing out among others, as well as to display wealth and attract potential mates. This is similar to how peacocks would display their feathers to show off their strength and stance. Water is a basic need and the most important need for preserving the life of a person. Although in the modern world of today where polluted water can easily be treated to be drinkable again, we tend to forget that the human body can typically survive only up to three days without any ingestion of water or fluids of any kind. Aside for the sake of preserving life, water serves as the primary means of sanitation for most households and families everywhere around the world. Another essential need for the preservation of human life is food. An average person is said to be able to survive up to three weeks without the consumption of any form of the nutrient. Food is a rather sensitive topic due to the fact that in most parts of the world, there is an ever growing shortage of food. This can be attributed to the fact that there is AN increasing population to feed and very little agricultural areas compared to in the past. In more stable nations, people tend to make use of intake assessment forms to be able to catalog and to be able to eat just enough food to sustain living without excessive feedback. What Is an Employee Training Needs Assessment Form? As we know, employees are an essential part of any organization due to the fact that they are the workforce that moves the organization towards their goals. As such, it is quite important to ensure that the employees of an organization are able to perform the task assigned to them with dedication and competence. Most organizations strive to create this kind of mindset so as to have their employees perform adequately. Thus the introduction of an employee training needs an employee training assessment form. Most organizations tend to have each employee undergo a series of training that would allow each to adapt and become more efficient with whatever task is being assigned to them. The purpose of such an assessment form would be to ensure that each employee that is undergoing training is indeed improving their skills and is becoming more competent and independent. What Is an Annual Training Needs Assessment Form? An annual training needs assessment form is a type of assessment form that is used as a means of quality assurance of an employee’s performance; wherein the goal is to have the employee undergo training at least once a year so as to have the employee brush up on their skills, and address any issue or concern they may have with the task assigned to them. It is also a rather useful time to review and relearn any forgotten skill required to perform the assigned task. An annual training needs assessment form is a type of assessment form that would allow employers to evaluate the level of progress an employee will be showing during their training period and will also serve as a means of identifying what the employee needs improvements on. What Is a Community Needs Assessment Form? A community is a group or a society of people who are often neighbors or lie within the same area. In other words, a community can be defined as the general public. As such, they will have some needs and concerns when it comes to their state of living. Rather than sending a request form to their respected district officials, most officials will tend to set up a certain schedule to conduct a community needs assessment to identify the needs and concerns of the general public, and determine which of those needs can be solved immediately. What Is a Care Needs Assessment Form? Care is often defined as an action that a person will provide to another person or object to ensure that the person or item of interest will be able to perform their specified task constantly. A care needs assessment form is used to identify the requirements a person will need to provide care to another person or item of interest. 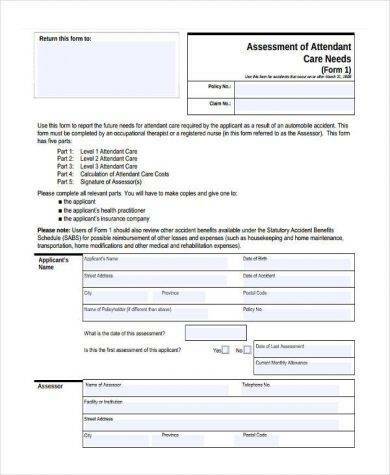 This type of need assessment form is often associated with that of a medical feedback form due to the fact that the information gathered from the assessment will often be treated as feedback and will often be a deciding factor on how to approach the concern of giving the right amount of care. What Is an Education Needs Assessment Form? As we know, education simply means the process of increasing the level of intellect of a person through the process of learning. Without a doubt, proper education is an important factor when it comes to building the future of a person. So, it only makes sense if a person would try to find a way to identify what form of education they should focus on learning, as well as how they should approach the goal of learning. Thus, there is a need for an educational needs assessment form. It identifies and implements means of improving the educational performance of a person. This form of assessment is typically related to that of a school evaluation form, because when it comes to an education need assessment form, most evaluators will evaluate the school itself to identify the quality of education being provided at each academic institution to help the evaluator decide which academic institution is best suited for the person. What Is a Request Form? A request can be considered as a means of acquiring something by politely asking a person to perform a certain task but does not actually force the person to do the task. A request form is basically the same thing. It is a type of document a person may send to a receiver to politely request the person to perform a certain task. Although the receiver has the right to refuse the request, they are required to send a reply to the sender stating the reason why they are unable to comply with the request of the sender. The most commonly used request form would be a supply request form. Most organizations have a tendency to use these request forms to acquire much-needed resources and materials to continue producing their products up to the standards that are set for the products. What Is a Needs Assessment Request Form? A needs assessment request form is used as a request form as well. This is typically used as a means of acquiring the necessary materials and resources for the sake of completing the assessment quickly and efficiently as well as to identify all needs. This type of needs assessment form can also be used as a type of parental consent form if it will especially be used for children or other dependent individuals to identify the necessary changes and alterations that must be done to improve the status of those individuals. Research is termed as an action that involves the analyzing of pieces of information which are gathered from several sources to come up with either a hypothesis or a theory of a certain subject of interest. Researching is a rather influential part of a nation due to the fact that the amount of research being done whether for medical research, agricultural research, or even technological research will directly affect the state of the nation due to the fact that most research proposals typically aim to improve certain aspects of the nation in some way which would tend to increase the overall capability of a nation. Research is also a means of progressing a nation further simply because research allows invention or realizations of new technology, or information that would typically be beneficial to the entire nation. What Is a Research Needs Assessment Form? A research needs assessment form is a type of needs assessment form that focuses on the goal of increasing the progress of completing the research of a certain individual or group. This type of assessment form is typically viewed as a means of identifying which research team member is performing well and which member is under-performing. In terms of research, it is actually quite easier to retrain the person than to replace them with a new recruit due to the fact that it would normally take double effort to actually train a new recruit, rather than just reassessing and retraining an under-performing researcher. Regardless of the method being implemented to improve the speed of research, there will be a need for a training assessment form to ensure that the person being trained is ready to assist the others in completing the research project faster. Conducting a needs assessment is a rather effective means of ensuring everyone has what they need to continue performing well. However, why is it important to conduct such an assessment well? For starters, it offers a simpler means of identifying flaws and problems compared to let us say an employee submitting a complaint form to their HR or human resource manager which would need to be processed then submit further up the chain of command. The latter definitely takes up too much time. Another reason would be to improve employee interactions with one another simply because an assessment will require the evaluator to interact with the person being assessed. In some way, it allows the evaluator and the one evaluated to feel more familiar with one another which would then lead to a higher level of employee satisfaction in the workplace.